Anyone automating their Jenkins pipelines through batch jobs or shell scripts knows the value of referencing entries on the Jenkins environment variables list. But not everyone realizes that once you start using the Jenkins Git integration plugin, a vast array of of new Jenkins Git environment variables become available to your builds. Okay, calling it a vast array may be overstating things. To be precise, there are eleven new Jenkins Git environment variables that become available to your builds when the Jenkins Git plugin is installed. The following shows the Jenkins Git plugin configuration for the freestyle project, along with the content of the batch script. 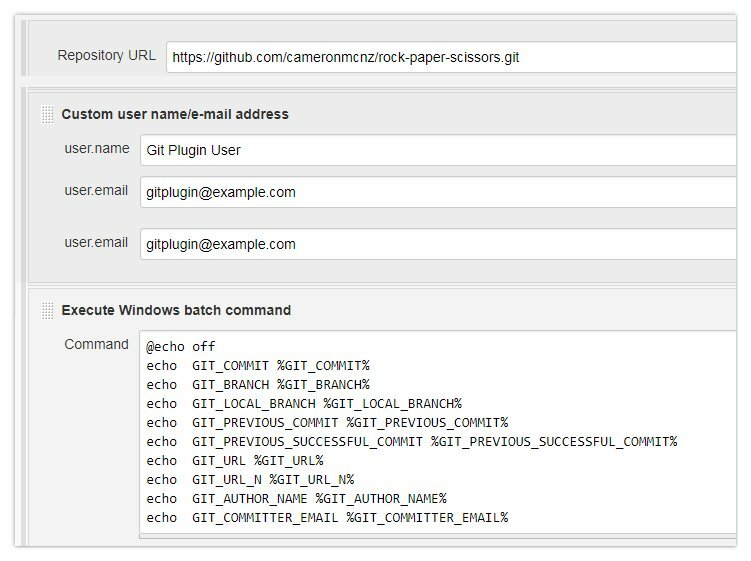 Note the Jenkins Git option to add a custom user name and email address was selected. The values used here will become part of the output when the build is run. Jenkins Git plugin configuration in the freestyle project. As you can see, there were no major surprises when it came to viewing the output of the Jenkins build job, which is exactly what you want when you’re utilizing Jenkins Git environment variables in your build jobs. New to Git and distributed version control? Here are some Git examples and tutorials designed to help you master the popular source code versioning tool. What happens when you git reset –hard and push to GitHub?